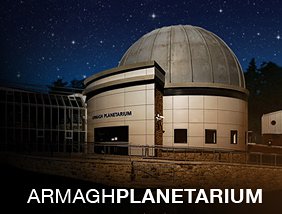 Visit the Armagh Observatory and Planetarium for an evening of Star Tracking. Enjoy a Digital Theatre show chosen by the Observatory Director Professor Michael Burton and weather permitting be fascinated by the views of the night sky and the Moon through their 12 inch telescope. There will also be astronomy talks in the Copernicus Hall. Prior booking required. This event is being organised by Armagh Observatory who should be contacted if you have any queries. We highly recommend you confirm this event is indeed going ahead before travelling. If you do attend it would be fantastic if you could let the organiser know you found them via Go Stargazing! Please contact Armagh Observatory directly for more details regarding this event or, if appropriate, contact the event venue.